Every little girl dreams of becoming a Mommy when she grows up. When I found out I was pregnant for the first time, I was excited and scared to death! My husband and I both agreed that I was going to stay home with our children and be a stay-at-home mom. We have never regretted our decision, I have the most rewarding job there is and I wouldn't trade it for anything else in the world. 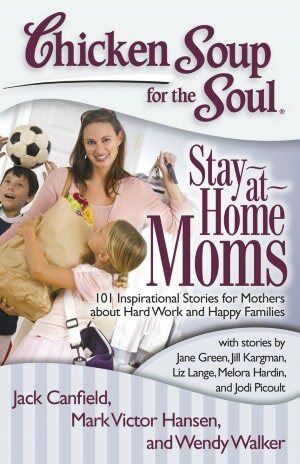 With stories by famous moms, including Jane Green, Melora Hardin, Liz Lange, Jodi Picoult, and Jill Kargman, and stories from other moms who elected to stay at home or work from home. Every stay-at-home and work-from-home mom will view this book as having been written just for her! Originally issued as Chicken Soup for the Soul: Power Moms, this book contains 101 great stories from mothers who have made the choice to stay home or work from home while raising their families. These multi-tasking, high-performing women have become today’s power mom. This is perfect for book groups as it contains a reader guide. This giveaway will end July 21st at Midnight EST. Disclaimer: I received a complimentary copy of Chicken Soup for the Soul: Stay-at-Home Moms for the purpose of writing a review and hosting a giveaway. Regardless, I only recommend products or services I use personally and/or believe will be a good fit for my readers. The views and opinions expressed on this blog are purely my own. Results may vary. No monetary compensation was received. Being a mom is the best job in the world.My daughter is grown now,but she's still my baby.I have 2 neices ages 4 and 8.Being an aunt is just as good as being a mom.I'm very blessed to have my 3 girls to love and who love me.Thanks for the awesome giveaway! I love watching my daughter grow. Being a mom is so special. It makes me feel so wanted and needed all the time. Hopefully, I am teaching my kids through example by how I live my daily life. My favorite thing is seeing my children grow! My favorite thing about being a Mom is getting to see my children growing into adults. My kids are my life. They are mini versions of myself and their Dad.